Spring is here in the Northern Hemisphere and we are off to some great beginnings. We are excited to announce the next release of MyPMS on Monday, April 22, 2019 at 10:00 PM PDT (Pacific Time).. This release brings enhancements to Rates and Reports as well as a few bug fixes. The estimated down time is 1 hours (60 minutes). During this time, the following services will be offline and not available, so please plan accordingly. MyPMS customers please take note: This downtime WILL affect your Property Management System, as the system will NOT be available during this period. North America and European customers, please schedule your Night Audit accordingly, and be sure to print out all necessary reports (we recommend any non-arrived guests to have their Registration Letters printed, for example) before 10 PM PDT (California Time) Sunday night. Southern hemisphere customers should consider printing Folios for departing check-outs, as this may impact your ‘check out’ hours. Desktop Property Management System updates will not work. The Booking Engine (what we sometimes refer to as the ‘Request Server’) will be unavailable during this time. Credit card processing via MyCard and AuthorizeNet will be unavailable during this time. GDS/OTA updating and booking retrievals will cease during this time, but activity that occurs on these sites will continue and will be sent to you when the system is restored. A reminder of the scheduled downtime will be posted for all MyPMS Users on the Front Desk in the "System Messages" area prior to service interruption. We appreciate your understanding of this inconvenience, and are here to answer any questions at: http://support.bookingcenter.com/ and +1-707-874-3922. TripAdvisor InstantBooking - We are excited to announce that we have added TripAdvisor's InstantBooking to the BookingCenter- TripAdvisor Module. The new InstantBooking feature lets guests book directly on the TripAdvisor site just like other OTA connections such as Expedia or Booking.com. InstantBooking is the 'commission' option that TripAdvisor offers in lieu of the TripConnect 'CPC' (cost per click) model, so a property can choose one or the either. As a Certified TripAdvisor Partner, BookingCenter offers a seamless connection with synchronized availability and rate, room allocation control, and instant booking. Contact us to get started. Self Check-in: Self Check-in System can be enabled for any MyPMS Customer and <optionally> integrated into the MyGuest Guest Request System. FulI PMS integration insures that guest data is stored and available for the guest’s next stay. The Self Check-in system is completely automated from start to finish and includes automatic messaging, payment authorization, Esign – digital signing (optional) and room specific information allowing detailed instructions supporting a mix of 'traditional' (hotel, inn, resort) and 'non traditional' (vacation rentals, cabins, etc) operations. Learn how to setup and use Self Check-in. SMS Text Messaging Support: SMS Messaging is now integrated into the booking process, allowing you to create and send SMS text message to Guests. Once enabled, they can be sent manually from the Letters Tab of any booking or automatically using the "Auto Letters" Function. Contact us for pricing and to get started. New Auto Letter Events and Merge Fields for Letters: There are three new Auto Letter Events that can be used for Email and/or SMS Text Messaging. See Add or Edit SMS Letters. eSign Email and SMS: Used to start the eSign Digital Document Signing Process. This function will send a Letter or Message to the guest with a link to the eSign Signature Letter. eSign - Digital Document Signing. Self Check-in Email and SMS: Used to start the Self Check-in process. This function will send a Letter or Message to the guest with a secure link to MyBooking. Self Check-in System. Booking Made Today Letter and SMS: This new event gives you the ability to automatically send a Letter or SMS Message to the Guest at the time of Booking. See Auto Letters. Learn how to customize Letters using Merge Fields. Report Enhancements: Item Analysis Report - You can now use the Item Analysis Report to track items with $0 on the folio. This is useful for tracking Inventory items that are not sold, but just tracked for Housekeeping, etc. See Item Analysis Report. New Merge Field For Letters: Added the merge field "Drivers license" to Letters. This field can be custom labeled and used for any code, coupon or other guest details you need. Learn how to customize Letters using Merge Fields. Exportable Request Reports: The Reports section gives you the ability to create a Requests Report using different parameters, very similar to the Transactions Report in MyPMS. Once the Report is created, it can be exported to a CSV. file (thus opened in a program such as Microsoft's Excel or Apple's Numbers). Learn more about MyGuest | Request Reports. Search Guests Feature: The "Search Guests" feature gives managers the ability to search for guests by name, email or phone #. Once the Guest record(s) are located, the Guest Details can be edited and the number of requests submitted by the guest will be displayed and linked to.. Learn more about MyGuest | SEARCH Guests. Management Section is available to Users with "Manager" level access. The Management section allows Managers to manage and edit Users, Guest Records, and Forms. Learn more about MyGuest | Management. New MyGuest Tab in MyPMS: A new MyGuest Tab has been added to the details of each Booking. You can now easily see all (new, cancelled, and completed) Requests linked to a booking. Systemwide upgrade to PHP7 as a securtiy enhancement. Fixed issue with Online deposits not including tax on MyPMS imports to folio. Fixed issue with Child Rates not saving or inheriting restrictions on GDS systems and SynXis and Sabre. Fixed issue with CTA (closed to arrival) on Parent Rates Not Saving on on GDS systems and SynXis and Sabre. Users without OVERBooking privileges can no longer Overbook in Edit Tab of booking. Group booking managers can now Add Bookings to Soft Allocations saved for Group Blocks. Spring is here in the Northern Hemisphere and we are off to some great beginnings. We are excited to announce the next release of MyPMS on Sunday, March 24, 2019 at 10:00 PM PST (Pacific Time). This release brings major enhancements to the booking process in MyPMS, better integration with MyGuest, a new Self Check-in feature for automating operations, SMS Messaging support, eSign Digital Document Signing, TripAdvisor InstantBooking, and others. After the release on Sunday, we will send you details and instructions on how to get started with the new enhancements and services. The estimated down time is longer than normal - 2 hours (120 minutes). During this time, the following services will be offline and not available, so please plan accordingly. It's hard to believe that another busy holiday season is right around the corner! What better time to learn more about the features and functions available in MyPMS. Whether it's tips about managing bookings and the tape chart, using reports, or managing rates and restrictions - we want to make it easier for you! Our learning resources include an online manual, video tutorials, and hundreds of Knowledge articles. To get you started, we put together a list of tips, links to FAQ's, and step-by-step instructions based on some of your most commonly asked questions. There is much more, so go to one of our learning resources and search for your topic or question in our Knowledge Base, Online Manual, and Video Tutorials. Can I cancel a booking after its checked in? How do I restrict same day arrivals on my website? How do I add, edit or unlock a User in MyPMS? How do I use the Pass on Log on the Front Desk? Set up unique restrictions for Child Rates. What is the best use of House Account Folios and how do I manage them? How do I run a Tax Report? What Accounting Reports can I get in MyPMS? Since these Policies display on your Booking Engine and in the Default Confirmation Letter sent to the Guest when a Booking is completed, it is important to make sure these Policies are up-to-date. 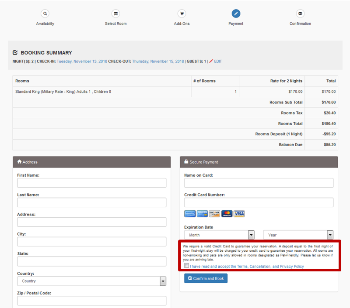 Please take a moment to review your Deposit and Cancellation Polices in the Marketing and Policies area and review the merge fields used in your Letters to make sure your policies are displaying correctly.